OMB Director Mick Mulvaney and White House Legislative Director Marc Short told reporters Thursday morning that — although Congress' massive government spending bill contains what the administration views as major concessions to Democrats — President Trump will sign it into law as it "funds his priorities." 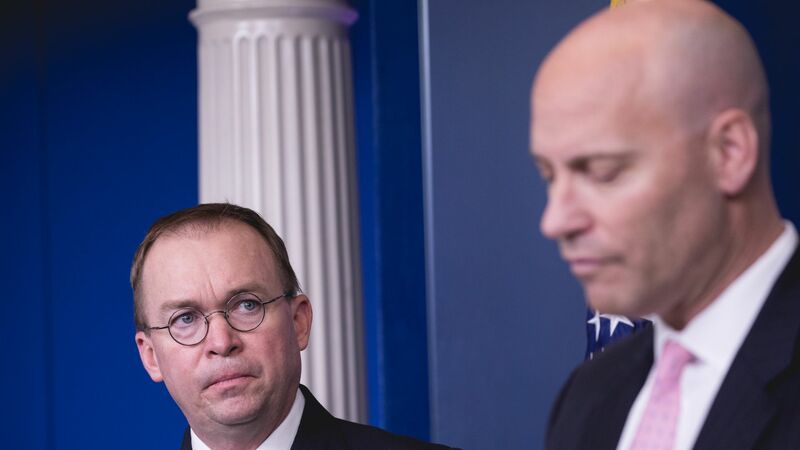 The blame game: Both Mulvaney and Short stressed that they would have been able to get more of what the administration wanted regarding immigration and cutting spending if Republicans "actually had control of the Senate." The wall: Mulvaney pointed to the fact that the wall funding gave more money and more barrier mileage than the administration had asked for — even though the language in the bill only allows for about 33 miles of new barrier. DACA: Short said that it was "absolutely clear" that Democrats "do not want a solution to this," saying that Trump has been trying to fix the problem. Sanctuary cities: "You will see the president continue to make this a priority." They said they will continue to bring attention to Oakland, where the mayor warned the community of an upcoming ICE raid.